Steiner Ranch homemaker Carol Killgore first heard about HTPRC as she sat with other women at Austin Christian Fellowship, assembling “goodie bags” and writing notes of encouragement for HTPRC moms during one of ACF’s Serve Our City projects. The Killgores have a connection with that kind of decision. Twelve years ago, they adopted their daughter at her birth. She is now 12 years old. Presumably, her birth mother could have chosen abortion. “I cannot imagine if my daughter was never born due to an uninformed decision so many years ago,” said Carol. And flow in they do – to Carol’s garage. “It becomes a temporary loading dock for all thingsHTPRC,” she said, smiling. 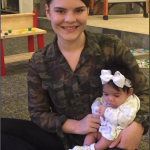 Recently, she received a donation of living room furniture that was delivered to aHTPRC mom who had just moved into her first apartment. 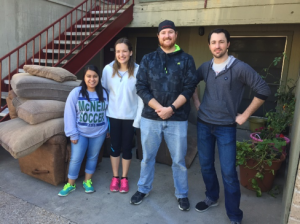 Staff members from Catalyst Teen Center pose with furniture they helped deliver to aHTPRC mom as part of a partnership with Covenant Presbyterian’s Movin’ and Groovin’ ministry to the homeless. 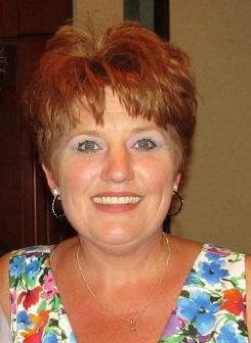 “One beautiful outflow is the art of paying it forward – right before my eyes,” she added. Steiner moms are now taking it upon themselves to arrange pickups through the neighborhood in their own network. Other Steiner spaces are becoming mini-hubs. 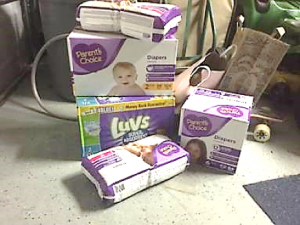 Meanwhile, atHTPRC – 20 miles and 32 driving minutes away unless it’s the rush hour – the supplies mean everything to East Austin moms who otherwise would not have the resources to be prepared to care for their newest family members.